Have you replaced your iMac’s Hard Drive with a new HDD or a SSD and the fan has started running at full speed creating a lot of noise? HDD Fan Control controls the fan speed in relation to the drive's temperature, slows the fan down preventing the loud noise and keeps your drive safe from overheating. iMac HDD Fan Control does not require Apple’s temperature sensor or cable to obtain the drives temperature as it uses the S.M.A.R.T (Self-Monitoring, Analysis and Reporting Technology) protocol built into all drives, this means you no longer need the temperature sensor or cable for the fan to operate correctly. Replacement Hard Drives or SSD's in an iMac cause the HDD Fan to run at full speed. Unlike other Fan Control Software, HDD Fan Control completely controls the fan speed making it run correctly again. Controls the fan speed to provide the correct cooling for your drive, preventing overheating and early failure whilst also keeping the fan quiet when cooling is not needed. HDD Fan Control does not use Apple's Internal Temperature Sensor, instead it uses the S.M.A.R.T interface built into every HDD and SSD to obtain the drives internal temperature. Unlike other Fan Control Software which can only increase the fan speed. HDD Fan Control directly controls the speed of the HDD Fan slowing it down when the drive is cool, and speeding it up to protect the drive from overheating when hot. Runs the fan at a speed appropriate for the HDD or SSD's actual temperature. Provides the correct cooling for your drive, preventing overheating and early failure whilst also keeping the fan quiet when cooling is not needed. Runs as a system process at startup, working even before or if a user has not logged in, and continuing to work until the iMac is shut down; totally independent of user login. HDD Fan Control allows you to install any HDD or SSD into your iMac, or install additional drives, and not have the loud noise from the iMac caused by the HDD Fan. Have confidence in knowing that the cooling has been setup for the new drive's specifications. Some SSD manufacturers have not implemented correct temperature readings over S.M.A.R.T for their SSD's. HDD Fan Control will still work with these SSD's by calculating the approximate temperature of the drive from the other internal sensors. It can also be setup to not use S.M.A.R.T for any drive if this is preferred. HDD Fan Control is used by Apple repair technicians all over the world and has proved itself as a great solution to the fan problem. If you are a technician looking for volume licensing please check our Volume Licensing, or for more custom requirements please contact us. Ability to define a custom relationship between Drive Temperature and Fan Speed for your drive's specific cooling needs and your fan noise preferences. We are constantly improving and testing the temperature control algorithm with new Hard Disks and SSD's to make sure we provide the best fan control possible, as such you get free Automatic updates of HDD Fan Control. HDD Fan Control comes with a small Application called HDD Fan Control Monitor. This lives in the Status Bar and displays the drive's current Temperature and the Fan Speed. OMG, I totally did not believe this was going to work. I took in my computer for a new hard drive and I as soon as I got it home the fan went crazy. I knew I wouldn’t be able to continue to work that way. Within seconds of installing this program the fan instantly went off. My sanity is restored! Thanks for the Fan Control software. The fan noise was freaking annoying after I replaced my 1TB HDD with a 2TB HDD. even though I replaced the HDD with the same brand (Seagate) that utilized the same temperature plug. Its great software and saved me a whole heap by enabling me to change out my HDD on my own, and not spend a lot of money. Can’t even tell you how much I appreciate your work. My wife was close to tossing the iMac out the window to get rid of the noise. I replaced a failed drive out of warranty with the same model (but no apple firmware) months ago. Wasn’t comfortable with the short solution, and Apple “genius” support told me I needed to buy an “apple” drive. We used this software to control the fan. By default, HDD Fan Control sets the speed of the fan to 1000 rpm, which is much quieter than the 6000 rpm that the fan spins at without the utility. Finally, I found HDD Fan Control. Installed it and instantly, the HDD fan went back down to 1600 rpm and the iMac was silent again. HDD Fan Control rocks, saved my sanity after replacing a failed 1TB Seagate drive in my 2009 iMac. Thanks guys for a great app that solve one of the most irritating issues with Apples policies. All I need to know now is how do I claim the cost back from Apple? Just wanted to extend my thanks for developing this software! I'm an audio engineer who was highly annoyed that the fans were going full blast, HUGE problem for any recording. I purchased HDD Fan Control a few months back and it really works great! Running well, no more fan noise!!! I've successfully installed your app on both partitions and the HDD fan is now under control both in Snow Leopard and Lion. The silence is absolutely wonderful! After a week without my iMac, I received it back from the service shop just to find that the fan was going crazy. At first I thought I would have to bring it back again for more service, but this software solution did the trick. Whoever thought of this product should be given a medal. I just got a crosier SSD drive my fan temperature was crazy loud. I'm not one for writing reviews or sending feedback but in the case of HDD Fan Control I just had to! I replaced a near dead hard drive in a 27" late 2009 iMac a couple of days ago and although the operation was a success I have since fallen victim to the HDD fan spinning itself up into a frenzy of 5500rpm and giving everyone in the office a headache! I was at a loss as to what to do about it especially as I found out about the firmware issue which basically means that you're stuffed really. Then I stumbled across your website. Bought and installed the HDD Fan Control software this morning. It worked immediately and has continued to do so all day so far. Awesome. Well, thanks for your replies and your support. The software is just what I needed. I used the demo of your product on my iMac, and as soon as I installed it, the fans started to work normally. 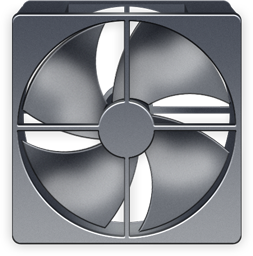 I was using smcFanControl with apple scripts to set the fan speed. That application worked at startup, but I had to make scripts to override after wake from sleep. I was not savvy enough to write a script to do that as well, so it was a manual task. The main problem with that setup was my Mac would wake from sleep on its own when I was not around, and I would return to a full fan speed Mac...not that happy. "Just replaced my drive with a new one yesterday as my warranty had ran out and found about your program which fixed my fan issue instantly, thank you for saving me a few bucks and lots of hair!!! If you would like to leave us a testimonial please use contact us. Thanks! *Surtees Studios Ltd claims no affiliation with Apple Inc. - "Apple", "Mac", "macOS", "Mac OS X" and the Apple Logo are registered trademarks of Apple Inc.